Alaska is to feature a deep, dark story that will have you feeling many different emotions. Once the first body has been found, murdered on the airstrip, YOU must make the decision on who to trust and who to not. Your best friend starts acting strange; the recluse on the other side of town has disappeared; Mr McWilliams’s rifle has gone missing and bloodstains have appeared outside the Andrew’s property. All this, plus more, will have you constantly second guessing who the killer is. Will you solve the mystery before the next murder is committed? In Alaska there are skills you must learn to survive the last frontier. These skills will help weave the story together as well as help you care for yourself and your neighbours. Along with the skills, there are also puzzles along the way. These puzzles will need to be completed as part of objectives. Objectives with puzzles include repairing water tanks, powering on electricity generators, setting up fireworks and many more. The conversations with your neighbours are to be a lot deeper in the full game, with multiple choice options that will truly shape your journey. Alaska displays a novel way of displaying your next objective... Postcards. Press ‘Q’ at any point of the game to reveal a post card of where you need to head to next. This is held in Blake’s left hand. The map is also displayed on a card, the map is held in Blake’s right hand. Press ‘E’ at any point of the game to display. 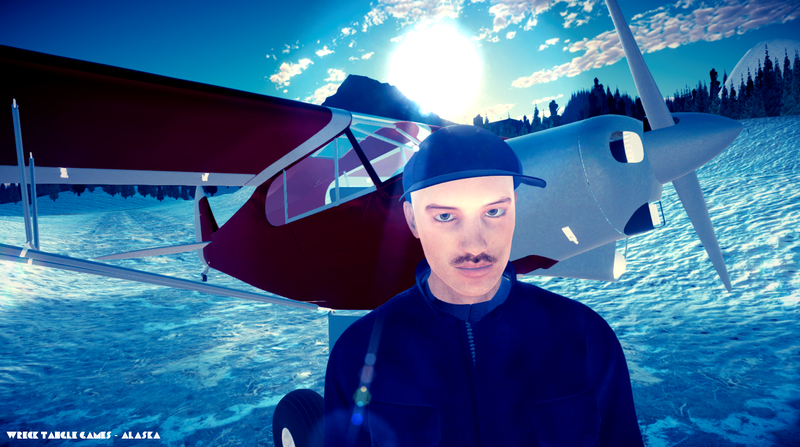 Alaska’s soundtrack is full of wonder and curiosity for the first half of the game, but as things start to get tenser, as the atmosphere changes, the music changes with it. The high notes of the piano, so whimsical, start to get lower and darker in tone. Having certificates in music composition, technology and performing, I feel more than capable that I will be able to make the soundtrack of Alaska exactly how I want it. Music will play a large part in Alaska, creating the atmosphere for this dark story. Wreck Tangle Games has partnered with KickBooster to give fans 30% Cash Back on every dollar they help Alaska fund on KickStarter. All you have to do is share Alaska's Campaign through KickBooster to all your friends and family. Come and help Alaska get Viral! 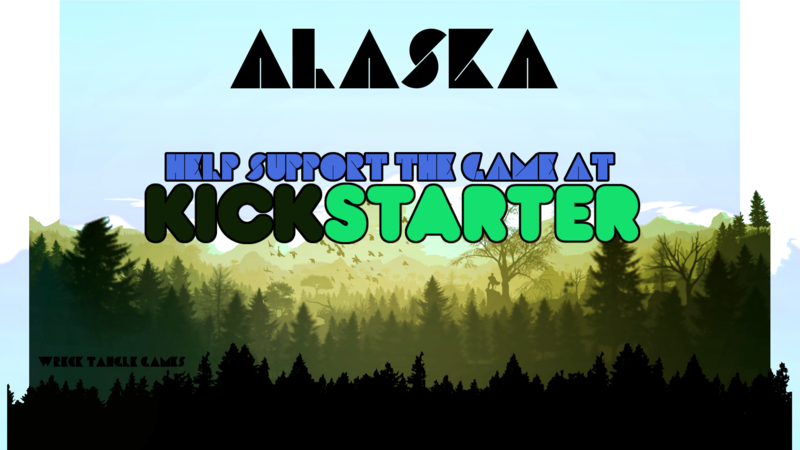 The one man behind Wreck Tangle Games, Adam Reed, has decided to launch a KickStarter Campaign in hopes to garner enough funds to continue development of his adventure game, ‘Alaska’, full time. With the new details, photos and videos, we get to see a lot more of Alaska than has been previously shown. Graphically the game has had a blizzard of improvements, the sun glistens off the footprints in the snow and the colours are so perfectly implemented, they make the outside feel cold but the insides of the cabins feel warm next to the roaring fires. New information, along with some GIFs and videos, show off some of the gameplay elements we can expect from the full version. You will learn skills as you progress through Alaska; these skills include fishing, wood chopping and hunting, and will have to be learnt to progress in objectives. Other gameplay elements include story driven puzzles and multi choice conversations with the characters that populate the small town. A body of one of your neighbours is found murdered on the town’s airstrip. This find will then lead you onto a traumatic adventure, where you will struggle to solve the mystery of who is the murderer. As everyone starts acting suspicious around you and more deaths occur, you must work out, who do you trust now? Not convinced that this game could be the next big indie hit? Play the small demo on Alaska’s GameJolt page and if you are still interested, find Alaska on KickStarter, help support this lone developer. We can assure you; this game is definitely one to watch.